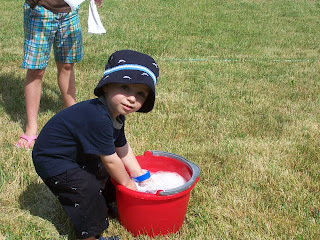 At the Hewlett child slave labor summer camp-we start them off young. 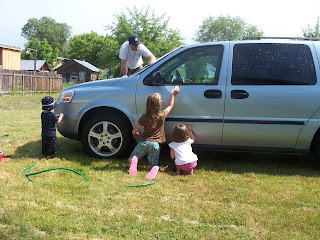 Chad had the kids working up a good sweat today cleaning the van, but don't worry , if they were cleaning in the wrong spot, he would spray them with the hose. They all got soaked, the van got clean and then the storm clouds rolled in. It hasn't started raining yet, but there has been thunder and lightening threatening ever since they finished. 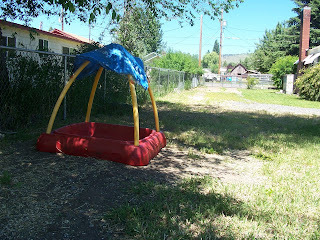 Klamath Falls typicaly gets 300 days of sunshine-wouldn't you know it, on one of the hottest days yet-Chad decides to clean the car, then Mother Nature decides, that today will be one of the 65 days that it rains or snows. Isn't it ironic, don't you think?-A little Alanis throwback for ya'll. We also went and watched Wall-E today-cute show, but...Topher kept screaming Wall-E the whole time just the way that the little robot says it on the preview, which the first couple times, I'm sure people thought was cute, maybe even a little endearing-by about 45 minutes in, I'm sure they were thinking murderous thoughts towards the parents of the once cute, but now annoying 2 year old boy sitting and yelling in the middle of the theatre. Isn't it amazing how those kinds of parents can block out their own child and still enjoy the movie, while everyone else is miserable? Feel free to throw handfuls of your 2 ton $10 bag of popcorn at me throughout the movie and dump the remains of your $8 super extra large soda on my head as you walk out of the theatre. I don't think I'd be surprised and I sure wouldn't blame ya, if you did! Can I just tell you how nice it is not to work anymore and just spend the day with my kids without worrying about anything but that! 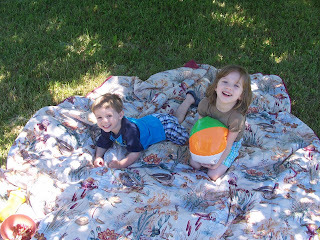 Bekah, Topher and I had a picnic out under one of our apple trees today and spent hours outside lying on the blanket, talking, laughing and looking at the different bugs and birds that buzzed around us. Oh and Bekah took these lovely shots for me to put on the computer-so here they are, I'm thinking of entering them in a photo contest. We drove home on Sunday, and it was miserable for me. I have had a sinus headache ever since. I am starting to feel a little better today and that is why I was able to post all these millions of posts. Exaggerating? Not much! Monday night we had family home evening on why there must be opposition in all things, and I felt like we all learned so much-the older kids are still talking about the 12 ways to overcome hardships that were in a talk by Ezra Taft Benson. I just want to list them because they are all so good. If you want to read his talk-it is excellent and it is here. 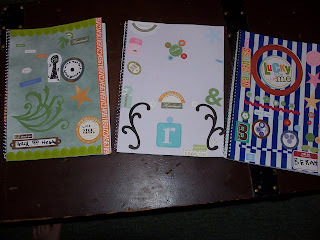 We made journals for the craft and everyone did an excellent job with NO help from parents. 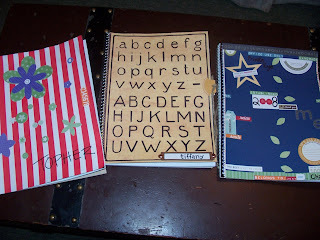 Seriously-I just laid out a bunch of stickers and stuff and stuff to glue to the front of a plain old notebook covered in the paper of their choice. Topher's, mine and Chad's-Topher's is a little girly-but still-how good is that for a 2 year old? Zach's, Ryeleigh's and Bekah's. I think Bekah's is my favorite-so much going on and her cute little name tag at the bottom-she is so cute and creative! On a much sadder note: I just want to let my dear friends Mike and Debbie McKinzie know how much I love them and how they will be in our prayers to overcome this difficult time. They lost their only son, who was 18. this week, and I can't even imagine how they must be feeling-so please remember them in your prayers that they will have strength to get through this. Okay, last day of the trip-sorry to put these in reverse! 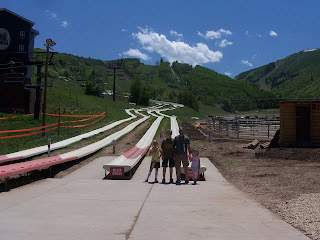 Saturday-we went back out to Park City to the Olympic Park, which I thought might be kind of lame and boring, at least for me-since I couldn't do any of the activities-but turned out super cool. 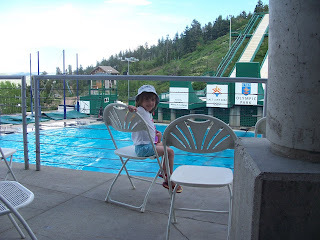 My mom paid for all of us to go on a little tour of the facilities and it was pretty fascinating to see the whole thing and learn all the little things about all the sports and what went on during the Olympics. 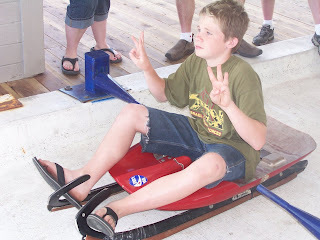 Zachary on the luge-looking a little terrified that the guy might actually make him go down the hill. 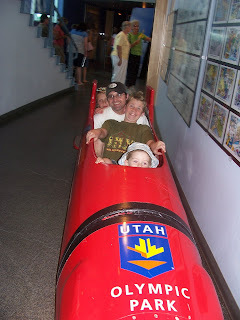 They used Zach as an example since he is the age at where they start training athletes to do the luge. Crazy! 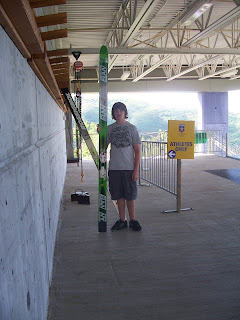 These are some ski's they use on the ski jump below-the guy had Tyler stand next to this to show how tall they were-and he said that the ski's Tyler would use are at least another foot longer-I can't even imagine! 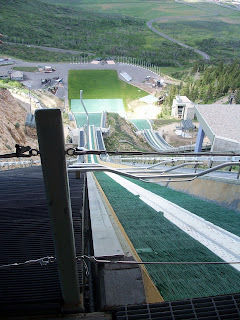 The ski jump below was so tall, it was a little freaky standing at the top of it, and I am not scared of heights at all. 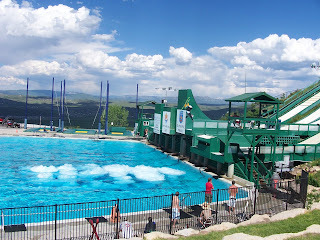 We then got to see some people practice on the ski jumps and land in a pool of water which was awesome and Bekah liked that part the best. 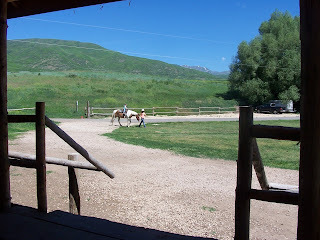 We stayed and watched them while Zach, Ryeleigh and Tyler went and did some of the rides. 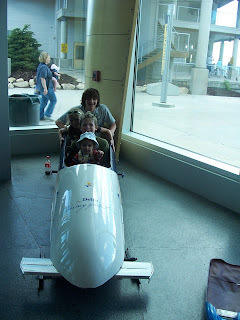 I would love to go back when I am not pregnant and do the bobsled-even though it would be as scary as anything-it would be a once in a lifetime thing that I would love to do. It's pricey though $60 for less than a minute ride-but you get up to over 4 g's which is what the astronauts hit when they go into space. If you go in the winter you go even faster and pay $140 more! Still wouldn't it be cool to do? Has anyone out there done it? My whole family above, our little growing family below. Well since we got the whole Hewlett crew together and had family pictures-we also got my whole family together for pictures. My cousin Jackie took them. She and her 3 kids and her mom, my aunt Jane and uncle Russel and their 2 grandkids that they raise, and 2 nieces that they are watching all came up and hung out with us for the day. The kids all went swimming and played around the resort for awhile-talk about a noisy afternoon-but it was lots of fun to see all of them-and some of the pictures turned out pretty cute. Me and my babies. The grandkids again. 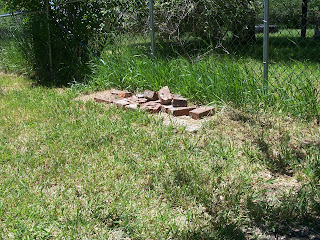 Topher would not stay nearby-but I think it's cute. The sisters. My princess. Sweet loves from my babies. The brothers. Typical. Me and Porter. I love this one-too sweet of my cuties. Me, my siblings and my mother. The whole crew again. Our little crew again. 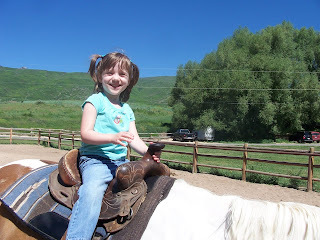 The train took us up to Soldier Summit where we all unboarded and followed some cowgirls and a cowboy over to the corral where everyone, but me and the 2 little ones and my sister and her baby, all saddled up on a horse for a 90 minute horseback ride up the mountain. 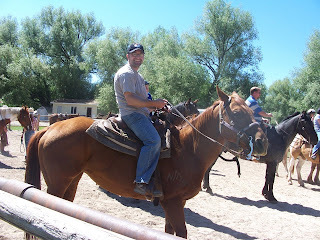 Zach on Valerie. Ryeleigh on Banschee. Chad on Chesney. 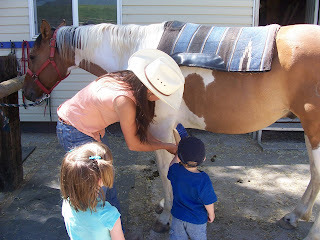 Fortunately the kids got entertained for a little bit, while everyone was saddling up they got to feed the horses some dandelions. 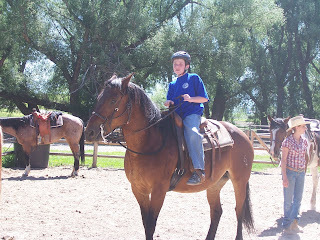 Then after everyone left, they got to help groom this pony Cherokee.... ...Then they got a little ride on him. Talk about Bekah's cup of tea! 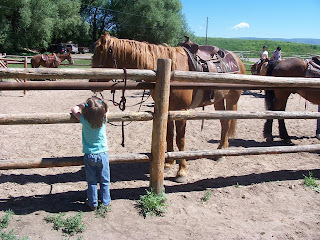 She was telling the cowgirl, how when she grows up she wants to be a cowgirl, and that she knows all about horses, and how to brush them, and how they need to eat lots of hay, and need to be ridden every day. Luckily the cowgirl was patient with her and even took her on a longer walk than she said she usually does, Bekah was so happy! Then it was Christopher's turn.... ...Mr. Serious. He didn't smile, not once. 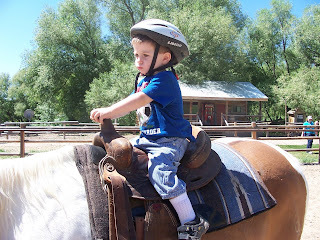 I knew he loved it though, because he would shout out commands to the cowgirl every few minutes-"this way!" "that way! ", and when it was time for him to get off-he held on to the horn and said "no" in the most stubborn way I have ever heard. 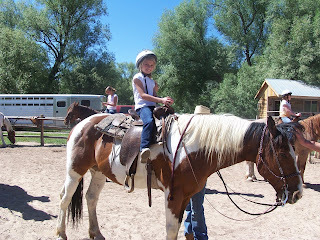 Then after the pony ride we sat. Luckily we had our lunches that they provided for us to occupy the kids for a bit, so I wasn't chasing the littlest one the entire time, trying to keep him out from under the horses. 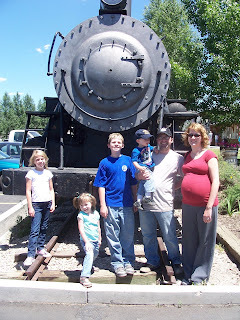 Then when they got back and all had their lunches we all got back on the train and headed back to the station. 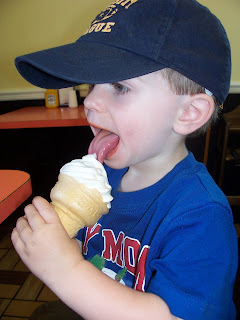 The kids were all wound up, they had such a fun day and to top it all off we headed to Granny's back in town where they have yummy ice cream and shakes. So give a bunch of wired kids a bunch of sugar and you get crazy. So we came home and let them run crazy for a bit-then I got my break! Scott and Suzanna invited us up to Sundance for dinner at the Tree Room sans kids. 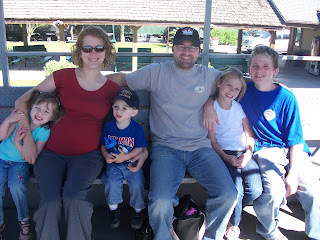 My family watched the kiddos and we went on a date with them and my mother in law. It was really nice to just have a grown up night out, even though the service was really bad-and for a $300 bill-you would think the waiter would have some tact! Too bad for him huh? My moms best friend Brenda and her fiance Mark came up to the resort for dinner with my family, so we got to spend a little bit of time with them too, it was a busy, crazy, but nice day. Thursday-Wow, this was an awesome day for my kids. Grandma Julie couldn't have picked a better set of activities for this day! 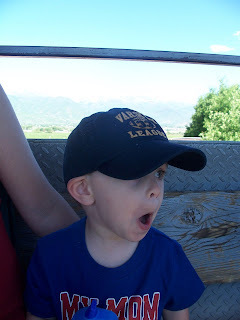 It started out on the Heber Creeper railroad and Topher was in absolute heaven! 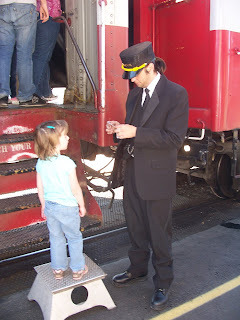 Here are the kids giving their tickets to the Conductor-which was cool enough in itself, then we all boarded the train and decided to sit in the open car for the better views, (and the cool breeze). Everytime the train whistled, (which was a lot, since we were going through town and had to cross a lot of streets), Christopher made this face, which made us laugh every time. 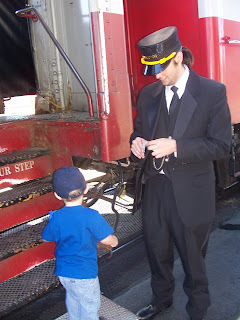 He thought this was the best day ever, he just kept saying choo choo and grinning from ear to ear. Here we are in front of one of the engines-and yes I really am that big and look like I'm ready to pop-everyone looks shocked when I tell them I still have until August, ha ha! 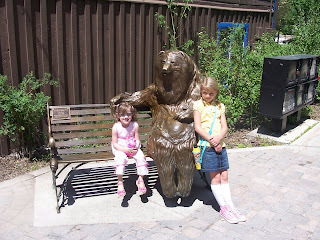 Wednesday we went to Park City for the day-when Bekah asked where we were going and I told her-she shrieked with joy. Apparently she thought it was a city of parks. She still had fun though. 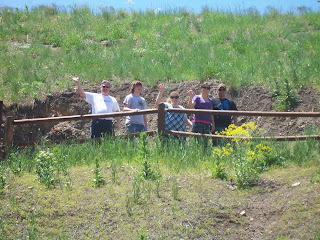 ...and these guys went down the zipline. 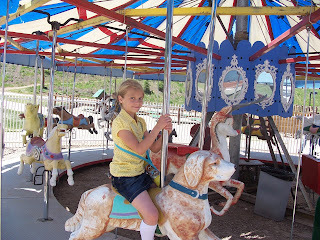 There was also this lovely carousel, that was rickety, old and the top had big rips in it-speaking of rips-it cost $3 a kid-per ride to ride this thing-so while Topher and I sat at the bottom, he did this twice and rode an equally lame airplane ride once-then when all the kids came down-they all wanted to ride it too-I said no-but you know the game-mom says no-grandma says yes. We probably could have bought the dumb thing for the amount we spent on tickets! Whatever. 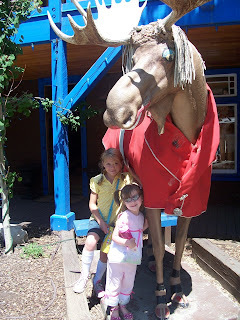 We ate at the Hungry Moose restaraunt in town for lunch and Bekah really wanted her picture in front of this moose-so there you go. 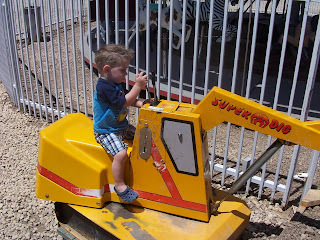 We then went shopping at the outlets for a bit and found some cute things for Porter-a coming home from the hospital outfit, some onesies and a few shirts-while everyone else went shopping in the ritzier downtown Park City. Don't get me wrong, the shops there are really cool-but they are all uphill and it was way too hot for this prego to handle. We went back to the resort-I took a nap while Chad took the kids to the pool, and then my grandma came over for dinner. Once again another crazy, busy day!